Violet helps a reclusive playwright finish his next work. Episode 7 - " "
The plot shows a lot of mirroring between Violet and they playwright's dead daughter Olivia. It started with Oscar Webster noticing Violet's hair was the same color as his Olivia and pretty near the same age she might have been had she not succumbed to whatever disease took her life. As always, the specifics of who Violet meets is not as important as how she reacts to them. Here, we see Violet empathizing with fictional characters and also becoming curious for how a story turns out. These are both big deals for Violet as she finally begins to feel her own emotions by recognizing others' and she begins to look forward to her own future with hope. Her own emotions deal with whether she deserves to have a future because she took so many lives during the War. She understands this as making people not keep their promises to their loved ones. That tied neatly with how Oscar thanked her for completing Olivia's promise to him of "someday walking across the lake." Look how Erica is so caught up in this play while Iris looks unimpressed. Erica was the one who read all those books by the author who used the first Auto Memoranda Doll, so that's keeping with her literary soul. Ah. Violet will be ghostwriting for the playwright Oscar Webster. That last line of the play sounds like Violet is going to take it to heart by the end of this episode, "Ah, I must live with my sin now, for the rest of my life." Nice foreshadowing with Cattleya asking if Claudia has told Violet that Gilbert is dead yet. Woof. Delirium tremens. She's not going to make a writer work without whiskey, is she? No empathy! Violet declares Oscar "quite the handful." This sounds like she picked up a certain phrase at some point. I'd like to see that episode. Uh oh. Can Violet cook? Oh. No, she cannot. Oscar points out she's actually empathizing. That's new to her. Yeah, this is a kids' play. It needs a happy ending. Is Violet's story for kids then? Oscar seems to have reasons for being alcoholic. He's all alone, but he's still wearing a wedding ring. Ah ha. 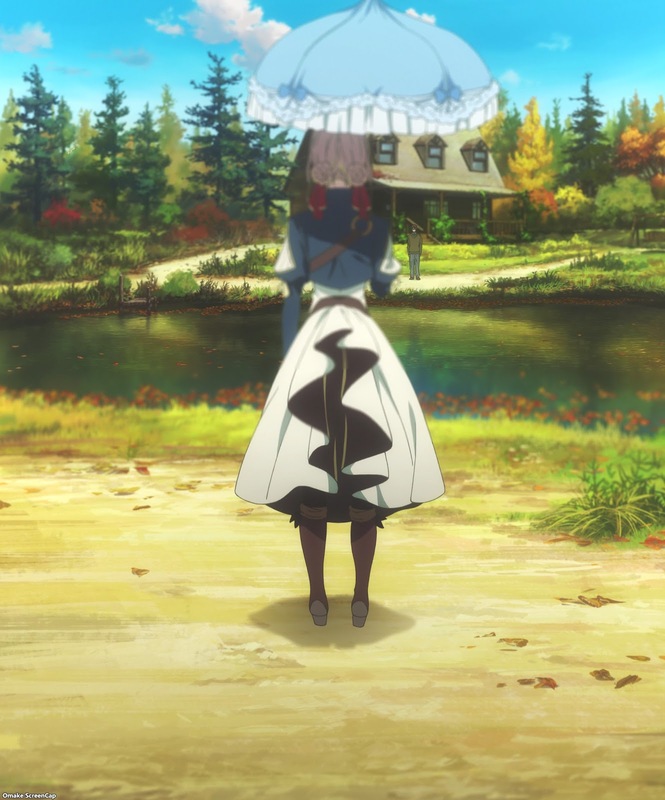 That parasol looks familiar. And it set Oscar off. Oh geez. Dead kid too. I think there's going to be a cathartic montage real soon. Oh, so that's why he's got writer's block. The character in his play needs to return to her father the way his own child did not. This is not healthy for him. Olive is the character in the play, while his daughter's name is Olivia. Well, it'll be healthy if he can write a happy ending for Olive. Aw. His wife died first, and then the daughter caught some kind of wasting disease. No wonder he's brokenhearted. Violet is still nibbling that brooch. She wants to nibble on Gilbert! Nice completeness here. Violet is still too realistic and suggests a plane appear to fly the character home. The playwright looks to his daughter for inspiration, using the parasol and walking on floating leaves. Violet's going to do it! Can she do it? I want to believe! Ah KyoAni! You got me with that montage with the Olivia growing up and dying. You got me with all the feels in the world. Haha! Violet is so proud. Three steps! 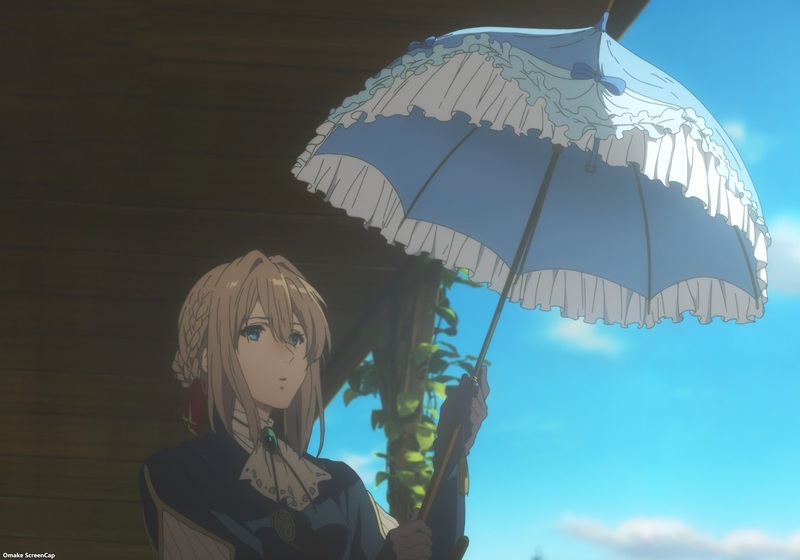 So this is where her parasol came from. Nice gift. Did Oscar just call Violet God? She did walk on water... Maybe the translation was clunky? Like, "I don't believe there is a God, but if there is proof of one, it must be you." Oh ho. The scene with Dietfried comes crashing back down on Violet as she begins to feel guilt and regret from being a tool of war. Maybe she's finally realizing she's not a tool, or someone's dog, but a person who actually killed other people. She made people break their promises. Oh no. Mrs. Evergarden let the cat out of the bag. The late Gilbert's soul can rest in peace. Wait. No body was found, but just the dog tag? You're telling me there's a chance! I want to believe! No words. Violet has no words to express what she's feeling. She's the one who said the title of the episode.